The mycotoxin binding agents market report illustrates data for 2018 (estimated) to 2027 (the forecast year), in terms of both, volume in MT and sales revenue in US$. The report comprises various forecast factors that impact the growth of the mycotoxin binding agents market. Market dynamics such as opportunities, drivers, trends, and restraints have also been included in the mycotoxin binding agents market report. Drivers impacting the mycotoxin binding agents market include the global climatic change spurring a rise in the contamination of mycotoxin, growth of poultry synergizing the demand for feed and feed additives, rising consumer awareness towards meat quality and product safety, and increasing use of compound feed, globally. There are certain restraints covered in the report too, such as rise in the cost of crop protection which inhibits the growth of mycotoxin binding agents, and lack of regulatory harmonization which hampers the growth of the mycotoxin binding agents market. The increasing demand for crop protection in emerging economies such as the Middle East and Africa, and the rising awareness regarding the issues related to mycotoxin are expected to create opportunities in the mycotoxin binding agents market. Major trends governing the mycotoxin binding agents market include various technological advancements in the mycotoxin binding agents industry, and growth of the animal feed industry, which directly pushes the growth of the mycotoxin binding agents market. We have also included an outlook for the global animal feed industry, major trends influencing the animal feed industry, global trends in the animal feed sector, an overview of the feed additives industry, and an overview of the mycotoxin binding agents. The report also comprises a strategic overview, followed by the value chain analysis and key information of the prominent players operating in the global mycotoxin binding agents market, along with a detailed competitive analysis. This information will give a thorough overview of the mycotoxin binding agents market, to the readers. 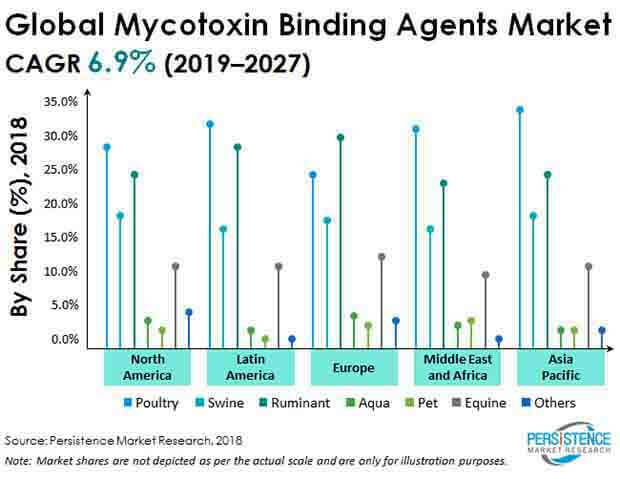 The mycotoxin binding agents market report also includes a market attractiveness analysis by product type, species, and region/country, along with absolute $ opportunity and incremental $ opportunity. There is a year-on-year growth trend covered in the report for every sub-segment. The report also includes market structure, and a detailed comparison between multinational players and regional players in the mycotoxin binding agents market. During the study of the mycotoxin binding agents market, our analysts observed that mycotoxin binding agents are largely used as zeolites and other treated aluminosilicates, as they contain a good amount of mycotoxin binding agents. By species, the poultry segment is expected to account for a significant share of the consumption of mycotoxin binding agents. Mycotoxin binding agents are used for others species as well, such as ruminants, swine, pet animas, aquaculture, equine, and others. The report states that mycotoxin binding agents find large-scale application in the APAC region when compared to other regions such as the Middle East and Africa, Europe, North America, and Latin America. This disparity in applications can be attributed to the increasing demand for poultry in the APAC region. The report also consists of the company profiles of prominent mycotoxin binding agent manufacturers, and the revenue generated by these companies across five regions – Latin America, North America, APAC (Asia Pacific), Europe, and MEA (Middle Eastern and Africa). To evaluate the revenue of mycotoxin binding agent manufacturers, the average price of mycotoxin binding agents was obtained from various suppliers, manufacturers, distributors, and exporters through quotes. Key application segments of mycotoxin binding agents were considered, and the dynamic ones were projected on the basis of feedback from different secondary sources and primary respondents. Data points were collected and considered for the modelling approach, which includes the overview of the feed industry, overview of feed additive manufacturers, overview of the mycotoxin binding agents industry, outlook of the animal feed industry, and the average purchase price of mycotoxin binding agents. Assuming that currency rates remain constant during the forecast period, the mycotoxin binding agents market value and volume were estimated. The mycotoxin binding agents market report also includes additional information such as animal feed- trade scenario, global economic outlook, mycotoxin binding agents market volume analysis outlook, mycotoxin binding agents market trade outlook, key regulations in various regions, major trends in the animal feed industry, an outlook of the animal feed additives industry, forecast factors, and recent developments in the mycotoxin binding agents market. Various secondary and primary sources were consulted during the course of the study. Secondary sources include annual reports of major companies, recent publications, Factiva, and Hoovers. The mycotoxin binding agents market report also includes a detailed pricing analysis on the basis of product type for every region, and the trade scenario of mycotoxin binding agents. The trade scenario includes the data of top exporters and importers in the mycotoxin binding agents market. The report includes a detailed and descriptive competition dashboard of mycotoxin binding agents, which gives an overview of the companies that have been profiled. The regional presence of companies, revenue, product offerings, headquarters of companies, and the intensity of product types, ranging from high to low, are the points that are mentioned in the competition dashboard. A comprehensive competition analysis of the major companies in the mycotoxin binding agents market has also been provided in the report. This will help readers evaluate the long-term and the short-term strategies, various product offerings, and recent developments in the mycotoxin binding agents marketplace. Some of the key players analyzed in the mycotoxin binding agents market report are BASF SE, Cargill, Inc., Kemin Industries, Bayer AG, Novus International, Inc., Olmix S.A., BIOMIN Holding GmbH, Inc., Nutreco N.V., Syngenta International AG, Venkys (India) Ltd., Anpario plc., Impextraco N.V., Industrial Técnica Pecuaria, S.A. (ITPSA), Norel S.A, E.I. du Pont de Nemours & Co, Neospark Drugs and Chemicals Private Limited, Lipidos Toledo SA, Alltech Inc., PeterLabs Holdings Berhad, and Perstorp Holding AB, among other mycotoxin binding agent manufacturers. Mycotoxin binding agents are adsorbents that bind to mycotoxin and prevent them from being absorbed through the gut into the blood. The usage of mycotoxin binding agents was initiated after the failure of various other preventive measures against mycotoxins and mold. Mycotoxin binding agents are substances used for the reduction of contamination of feed by mycotoxin. Mycotoxin binding agents can help reduce or suppress the absorption of various other contaminants, help promote the excretion of mycotoxins, and help modify the mode of action regarding the binding of mycotoxins inside the body. Raw Clay - HSCAS, bentonite, montmorillonite. layered silicates [Si2O52-]. Clay is a fine-grained natural rock or soil material. Mycotoxin binding agents mostly use bentonite, which is an absorbent aluminum phyllosilicate clay, and consists mostly of montmorillonite. Zeolites and Other Treated Aluminosilicates - These are silicates made of the tetrahedrons of SiO4 and AlO4. Zeolites are micro-porous, aluminosilicate minerals commonly used as commercial adsorbents. Aluminosilicate minerals are minerals composed of aluminum, silicon, and oxygen. The adsorbent properties of aluminosilicate are used to bind mycotoxins. Polysaccharides - Polysaccharides are polymeric carbohydrate molecules. Other Materials - Other mycotoxin binding agents used for mycotoxin management are yeast cell walls and fibers (lignocellulose). Iran is one of the fastest growing economies, with around 300+ feed manufacturers, and is mostly reliant on trade from other countries. Iran has witnessed a significant growth in the imports of feed, but the threat from mycotoxin has posed a great challenge. In 2014, mycotoxin contamination was estimated to be 6.7% for aquatic feed and 31.3% for poultry feed in Iran, creating high demand for mycotoxin binding agents and modifiers. The demand for mycotoxin binding agents is estimated to rise on the backdrop of the high prevalence of mycotoxin contamination and fast growing industries. In Africa, millions of dollars’ worth of trade was lost owing to mycotoxin contamination, and the mycotoxin levels were exceeding that of expectable limits in most countries. This loss of trade was attributed to the climate change that was causing mycotoxin buildup, thus driving the demand for mycotxin binding agents. For example, Al Khumasia Company (a feed and animal nutrition company in Saudi Arabia) is investing US$ 40 Mn in a mycotoxin binding agent crushing and packaging mill, and is planning to import animal feed and other raw material such as mycotoxin binding agents from Europe. With the success of the European Union’s 'MytoolBox' management system for tackling mycotoxin contamination in Europe, the EU has collaborated with China to help reduce its mycotoxin in feed by using mycotoxin binding agents, and increase the flow of trade. At present, the Chinese government does not have an authorized procedure for mycotoxin binding agents, and there is no protocol to verify the safety and efficacy of mycotoxin binding agents. The EU’s introduction of its mycotoxin binding agents in China, followed by their adoption, is expected to aid in increasing the trade of feed and feed additives. This, coupled with the installations of high feed production in China, is expected to drive the demand for mycotoxin binding agents. South Asian countries are amongst the most affected countries regarding mycotoxin. Aflatoxin is noted to be found with a high prevalence of around 87%. Greater dietary acceptance and rapid economic development of poultry and meat, eggs, and fish have resulted in continuous high growth rates of the mycotoxin binding agents market in the South Asian feed industry. Awareness pertaining to mycotoxins in feed and their effects have grown steadily. The significant rise of mycotoxins in the near future is expected to lead to the rapid demand for mycotoxin binding agents. Cargill Inc. (U.S.-based Agribusiness) established a mycotoxin binding agents management system, which uses records from the world’s pattern database and other analytical tools to offer an online service that determines mycotoxin levels in ingredients. The Mycohunt by the European Commission is a project that aims at developing a cost-effective method to detect mycotoxin infection in wheat grains, thereby, increasing the competitiveness of a large group of mycotoxin binding agents. R-Biopharm AG created a smart app - Rida Smart App, which helps by providing food and feed analysis, and clinical diagnostics. This app also helps evaluate LFDs (Lateral Flow Test) that are used for the immune-chromatographic analysis of mycotoxin binding agents.